MILFORD, Mass.--(BUSINESS WIRE)--Waters Corporation (NYSE:WAT) today introduced a new cation exchange column line with specialized consumables to simplify and improve the characterization and monitoring of monoclonal antibody (mAb) therapeutics. 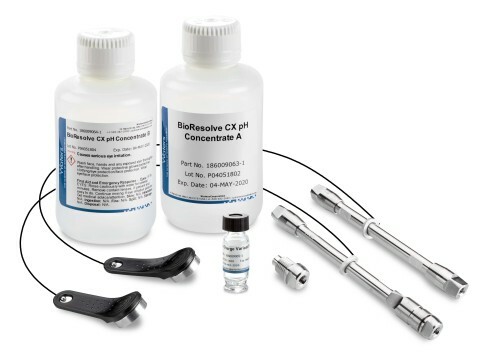 The new BioResolve™ SCX mAb Columns and Vanguard™ FIT Cartridge technologies, together with a suite of complementary consumables, enable mAb charge-variant analyses as required by the World Health Organization, the U.S. Food and Drug Administration, and the International Conference on Harmonization for confirming the efficacy and safety of biologics and biosimilars within discovery, development, and manufacturing applications. Waters BioResolve SCX mAb Columns and consumables simplify and improve monoclonal antibody charge variant analyses.